Do you suffer from dry hair? 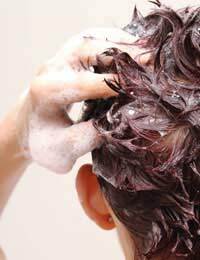 It's a common problem, often caused in part by the products we use to keep our hair clean and in shape. Yet the popular solution is to use more such products. Fortunately there are also natural ways that you can help your hair back to health, restoring its shine and bounce and helping you to recover your natural glow. Healthy hair is naturally lubricated by oils produced in the scalp. Dry hair can occur for two reasons - either because not enough of these oils are being produced in the first place, or because they are being stripped out of the hair before they have the chance to do their job. Each problem requires a different approach to treatment, so the first thing you need to do is work out what's happening in your case. If your hair has become worse after you've switched hair care products or started washing it more frequently, the chances are that you are losing oil faster than it can be replaced. The first thing to do is to try going back to your old products and washing it less often. Sometimes this will solve the problem by itself, but in other cases you will need further intervention to repair the damage done. If you have been ill, changed your diet, spent a lot of time in the sun or in cold places, or suffered from allergies on your scalp, the problem is more likely to be caused by inadequate oil production. You can use natural substances to substitute for the missing oil, but the aim should always be to help your scalp recover to the point where it can do an adequate job by itself. Reviving dry hair is a three stage process. First you'll need to strip away pollutants which may have attached themselves to the hair in its vulnerable state. Then you'll need to repair damage to the hair. Finally, you'll need to supply it with a healthy coating of oil, ideally one similar to the oil normally produced by the scalp. To undertake the first stage of treatment, wash your hair with a gentle astringent like orange flower water, or add a teaspoonful of lemon juice to a mild shampoo. Leave it in for two minutes and then rinse. To repair hair, it's best to use a binding protein similar to the structures in hair itself. Egg is especially good for this. For average length hair, take a whole egg and beat the white and yolk together, then massage it into your hair and leave it for ten minutes before rinsing with lots of warm water. If the smell bothers you, try adding a few drops of scented oil. For vegans and people with egg allergies, blue green algae or coconut oil make good alternatives. There are lots of choices for oiling your hair, so experiment to see what is best for you. Coconut, jojoba or olive oils are among the best, and can be left in overnight for an initial deep conditioning treatment. To follow up after washing, rub just a few drops into your palms and smooth them over your hair as it dries. Rose or almond oils combine great restorative effects with appealing scents. If your hair is in a really bad way and needs urgent treatment, one approach you can take is to steam it. Mix a teaspoonful of one of the above mentioned oils into a basin full of hot water and soak a towel in it. Then use the towel to wrap up your hair. Leave it in place until the towel dries naturally or gets too cold to wear. This will allow the oils to gently infuse through your hair. It's a kinder treatment than washing and can make a good interim measure. Inadequate production of oil by the scalp is often down to dietary deficiency. A common problem is dehydration - your body can't look after your hair properly if you're not drinking enough water. It's also important to get plenty of healthy fats, which may be missing from your diet if you're trying to lose weight. These can be found in nuts, fish, avocado, banana, olives, flax and sunflower seeds. They won't make you heavy but will boost the health of your skin and hair. For long term hair health, always be sure to protect your hair from the elements and give it a deep conditioning treatment in the event of accidental exposure. The sooner you act, the easier it will be to restore it to its optimal state.